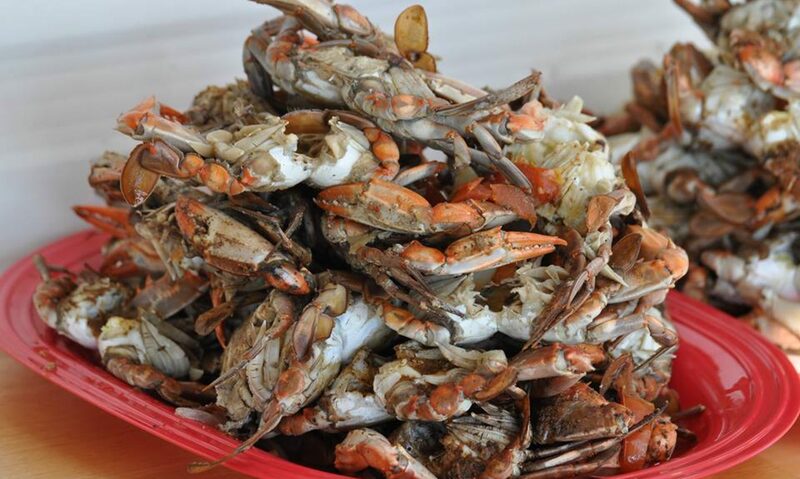 Blue claw crabs are sold live and priced based on size and availability. Purchases can be picked up at the dock or delivered. Crabs are live when leaving the dock and precautions are taken to ensure live delivery but sometimes crabs die during transport. We do not offer protection from the risk of crabs dying during delivery. To avoid this risk, request that crabs be already cleaned or steamed and delivered on ice. Steaming, cleaning and freezing is performed by a licensed food processing facility in Pennsylvania. Prices are typically highest on summer weekends and holidays and lower early in the week. Colossal – Hard crab measuring 6 ½ inches or more. Jumbo – Hard crab measuring 6 to 6 ½ inches in size. Large – Hard crab measuring 5 ½ to 6 inches in size. Medium – Hard crab measuring 5 to 5 ½ inches in size. Small – Hard crab measuring 4 3/4 to 5 inches in size, usually females. Price does not include shipping or local delivery. We calculate the shipping or delivery charge manually and add it to the order price with your separate approval later after an order is placed.